For as long as there has been gaming, there has been dice and every gamer has a set that he loves, loathes, and places the fate of his characters upon. A gamer’s dice can be as simple or as sophisticated as he wants, whether that is a set of dice that he can use with any roleplaying game or a set of dice particular to a specific roleplaying game, for example, the dice for Cubicle Seven Entertainment’s The One Ring RPG or any one of the Star Wars RPGs published by Fantasy Flight Games, such Star Wars: Edge of Empire, because their mechanics and their dice warrant it. Of course, this does not stop publishers and manufacturers creating and publishing dice for specific games which are themed around said games rather than mechanics. 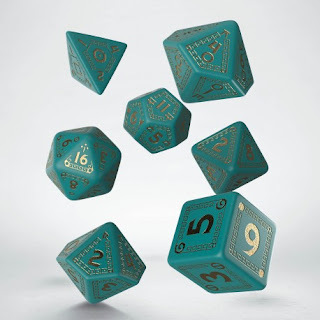 Chaosium, Inc. is one such publisher, working with Q-Workshop to create several dice sets for Call of Cthulhu, including for Call of Cthulhu, Seventh Edition. This included a complete set of metal dice for the new edition of the roleplaying game. The very latest dice set from Q-Workshop for Chaosium, Inc. is for the newest roleplaying game from Chaosium—RuneQuest: Roleplaying in Glorantha. 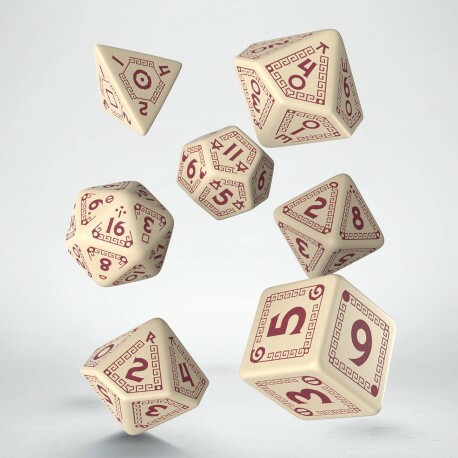 In general, the numbers on the dice are easy to read, but those on the Burgundy on Beige set are easier to read than those on the Gold on Turquoise set. Anyone rolling the higher numbered dice—ten-sided and above—will have to take care when identifying the six or the nine as the dot used to determine which way up they should be is a bit small, especially on the twenty-sided die. In addition to the numbers, the face on each die has a bronze age style pattern border and is marked with a single rune. They start off with Air, Earth, Fire, and Water—the four basic Elementals Runes—on the four-sided die, to which are added Darkness and Moon on the six-sided die to cover the full six Elemental Runes. The Death, Disorder, Harmony, Illusion, Life, Movement, Stasis, and Truth Power Runes appear on the eight-sided die, whilst the Form Runes—Fate Infinity, Luck, Magic, and Mastery—appear on the ten-sided dice not once, but twice. This is on both the standard ten-sided die and on the percentile ten-sided die. The Beast, Chaos, Dragonnewt, Man, Plant, and Spirit Form Runes appear not twice, but four times on the twelve-sided die—twice on two different faces. Lastly, the Air, Beast, Chaos, Darkness, Death, Disorder, Dragonnewt, Earth, Fate, Fertility, Fire, Illusion, Man, Moon, Movement, Plant, Spirit, Stasis, Truth, and Water Runes appear on twenty-sided die. What this means is that it is possible for a player or Game Master to roll Runes as well as numbers. This can be useful in 13th Age Glorantha where the Runes have to be rolled at the start of adventures. That said, whilst none of the Runes impinge upon the numbers, there is problem with the Runes having to share the same die faces as the usual numbers. On the lower number dice, the four-sided and the six-sided, the Runes are easy to identify. On the higher number dice, especially on the twenty-sided die, the Runes are small and far from easy to identify. Again, the Runes are easier to read on the Burgundy on Beige set as the contrast is better. Perhaps though, a Rune set of dice, with the Runes placed more prominently, might be a nice addition to the range? The good news is that Q-Workshop will be producing another pair of dice sets for RuneQuest: Roleplaying in Glorantha. These are Expansion Dice sets, again in the Burgundy on Beige and Gold on Turquoise colours. They will include an easy-to-read Runic twenty-sided die, a twenty-sided Hit Location die, and a twelve-sided die for tracking Strike Ranks in combat. Should Q-Workshop decide to design a further set, then a Lunar-themed set might be an idea—perhaps ‘Gold on Scarlet’? And if there is a RuneQuest: Roleplaying in Glorantha metal dice set, then they definitely have to be bronze—at least in colour. In the hand, the dice feel a bit light, but that is probably down to personal preference. In practice, neither the Burgundy on Beige or the Gold on Turquoise set felt any different when rolled. (A personal issue is that the Gold on Turquoise did not stand out as well on my dark green felt dice tray, but a different dice tray would solve that.) One problem for Gloranthaphiles is that more one of them at the table may have a set of these, so perhaps they need to take a little extra care in counting many dice they have their RuneQuest: Roleplaying in Glorantha Dice Set at the end of each session. The good news is that neither RuneQuest: Roleplaying in Glorantha Dice Set is just a RuneQuest: Roleplaying in Glorantha Dice Set. Of course, both will be used for that purpose and being a standard polyhedral set means that they can be used with many other roleplaying games, from Dungeons & Dragons to Savage Worlds. The fact that they can be used with other roleplaying games is of interest to both Chaosium and Gloranthophiles. The twenty-sided die can of course be used with HeroQuest Glorantha, whilst all of the dice can be used with 13th Age Glorantha. So devotees of all three roleplaying games—or even just one of them—will get use out of a RuneQuest: Roleplaying in Glorantha Dice Set. So of the two, which is better? The Burgundy on Beige set is better to use because its dice are easier to read, the Gold on Turquoise set is simply prettier. Opinions will vary though and other Gloranthaphiles will have their opinion. It is simply nice to have the choice to choose from. Either way, the RuneQuest: Roleplaying in Glorantha Dice Sets are nicely designed sets of dice, perfect for not just for one roleplaying game set in Glorantha, but for three—HeroQuest Glorantha, 13th Age Glorantha, and RuneQuest: Roleplaying in Glorantha.